shampoo, conditioner, 2 toothpastes, a vine, movie, outside broom, chicken, carrots, and potatoes for $14.67. That is right. 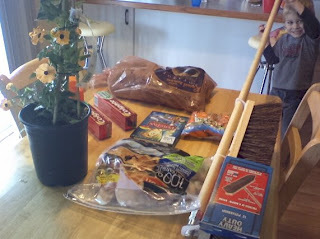 Over $54.00 of stuff for less than $15. That isn't counting what I saved just buying the stuff on sale in the first place. I felt a little guilty to be honest. But then I thought, hey they are the ones that put out the coupons, and if I actually am willing to clip them and stand in line with that many coupons, then I should do it. Why not? My husband works hard for our money. Today I think I spent it well. Good job. That reminds me how George loves to score double and triple hits when he grocery shops. He once came home with five heads of lettuce because it was such a bargain. Needless to say, four of them rotted before we could use them. Now, where is the savings in that? although i always forget to put them away some place i will remember to bring them to the store with me. i always forget them. I am Shellie. I have been given mercy when it wasn't deserved. I am blessed beyond my wildest imagination. My pain has not been in vain. I am the wife of my ever-growing husband, Steve. I am the mommy of Tiffani who teaches me kindness, Coral who teaches me how to be free, Lindsey who teaches me it is okay to believe in who I am, Amanda who teaches me perseverance, Ian who teaches me thoughtfulness, and Evan who teaches me to serve. I want to live my life not just endure it. I long to be filled with simplicity, kindness, and compassion. I believe that when we are fully alive, we experience brokenness and blessings each day...and I am okay with that...most days anyway. Evan said, "When I write my S, I get carried away and write an 8." So cute! How Did I End Up the Mother of a Blonde-Haired, Green-Eyed Boy? You Did What With a Maxipad?